Literary Classics: Bedtime for Buzzy earns the Literary Classics Seal of Approval. Bedtime for Buzzy earns the Literary Classics Seal of Approval. With bed-time fast approaching, Buzzy is quite distraught. He simply can’t bear to leave his toys behind long enough to go to sleep. He entreats Moon Man, Captain Pirate and Giant Dinosaur all to stay up with him, determined that one of his adventuring friends must surely prefer to be awake over the boring alternative of sleep. T.J. Hackworth’s Bedtime for Buzzy is a wonderful picture book that is perfect for classroom reading and bedtime stories. This clever little tale is one with which children will certainly relate, and that will encourage kiddos to put their toys aside as they joyfully head off to a land of slumber wherein further adventures most assuredly await. 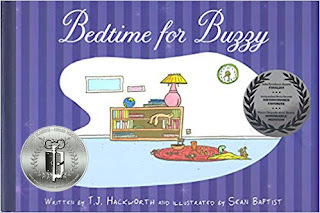 Recommended for home and school libraries, Bedtime for Buzzy has earned the Literary Classics Seal of Approval.